MasterPLAN has been educating our clients about the benefits of an indoor – outdoor seamless transition for quite some time, and for good reason! There are many advantages of blurring the lines between the inside of your home and the outside. 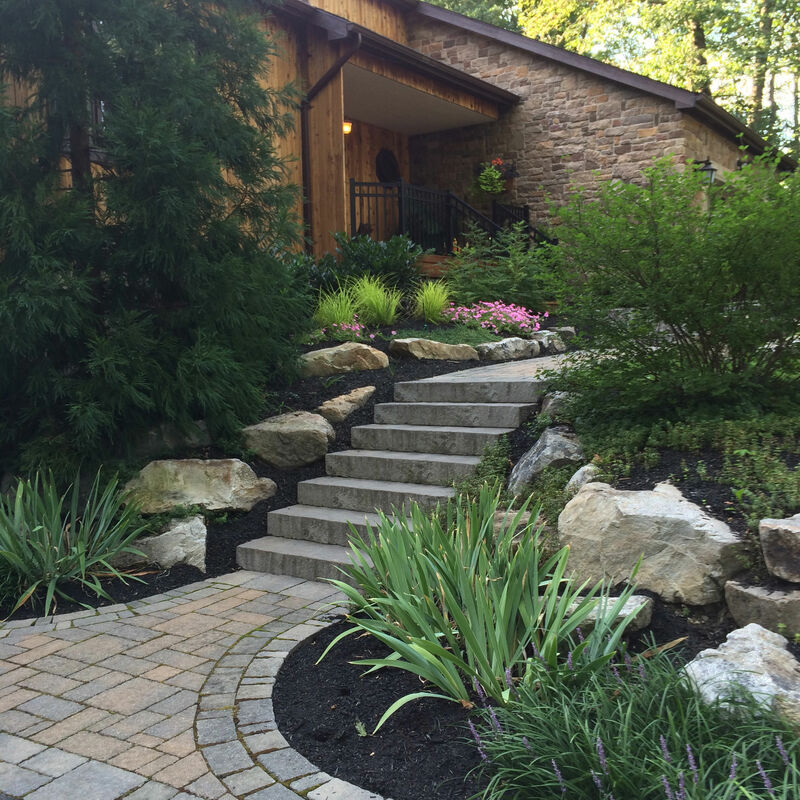 Eliminating steps and obstacles between your home and outdoor living space is not only safer for your family and company, but it also expands your livable space and subconsciously invites your guests outdoors. Opting to have a roof system installed over your patio or deck space further develops the transition, protecting your outdoor living space from intense sunshine and precipitation. Seamless indoor – outdoor transition is just the tip of the iceberg when it comes to offering the same comforts and conveniences as the same room inside the house. 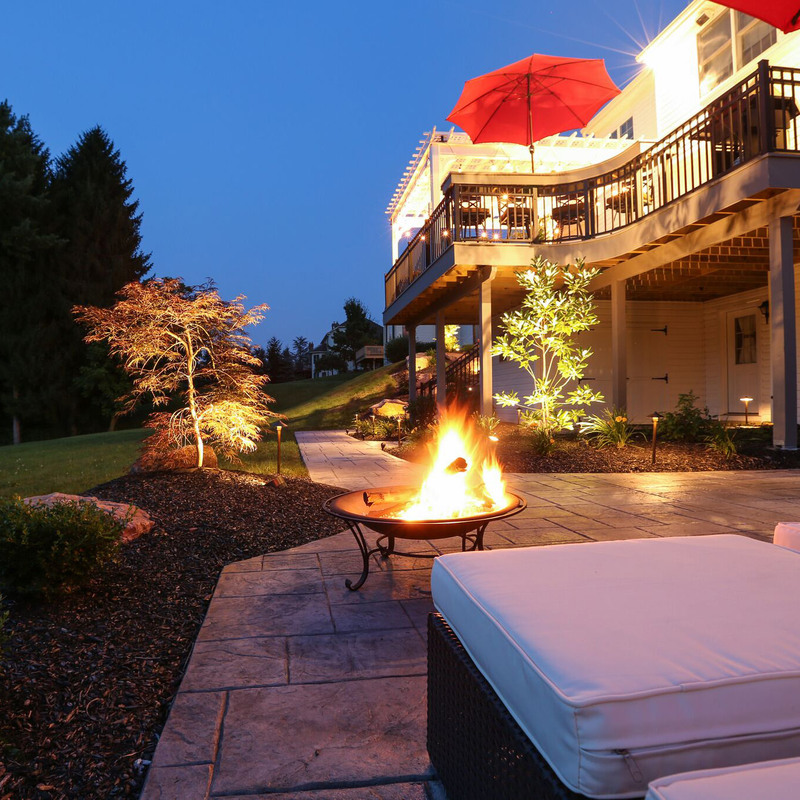 Speaking of the conveniences of home, let’s talk about outdoor flooring! 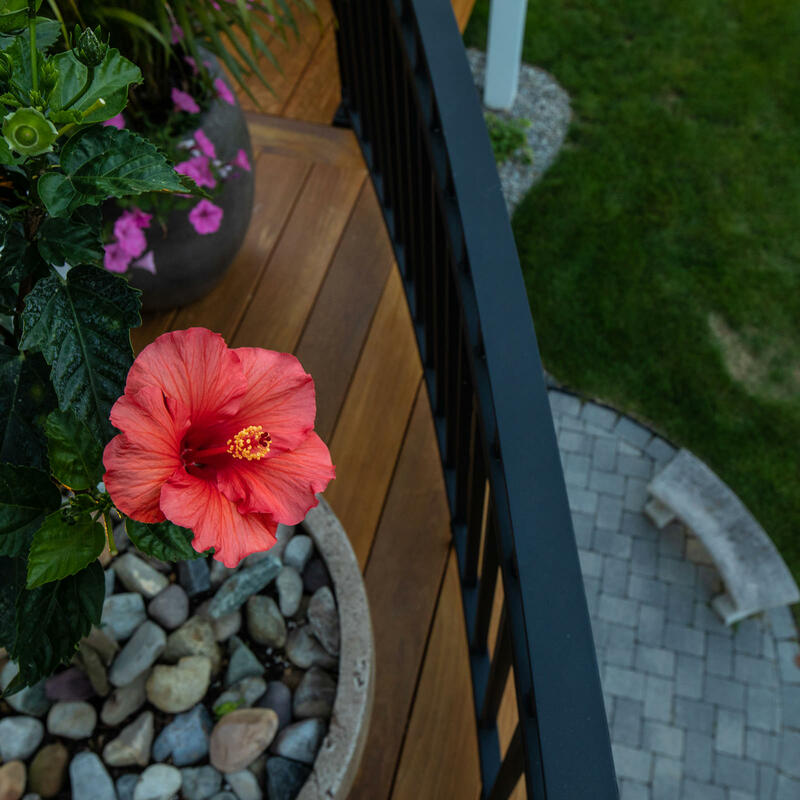 Long gone are the days of pressure treated decks and long live the days of low-maintenance and beautiful building materials. As we all know, the outdoors in the summertime is basically a shoe-free zone where a splinter in your foot has the potential to ruin your whole day. Composite decking will not splinter and is kind to your toes. The same can be said for tropical hardwoods like Ipe and Cumaru. Advancements in composite decking pattern, color and texture is a big benefit to the homeowner who is looking to closely match the flooring just on the other side of the threshold. Selecting a low-maintenance outdoor material that resembles the indoor flooring creates the illusion of a larger, blended space. 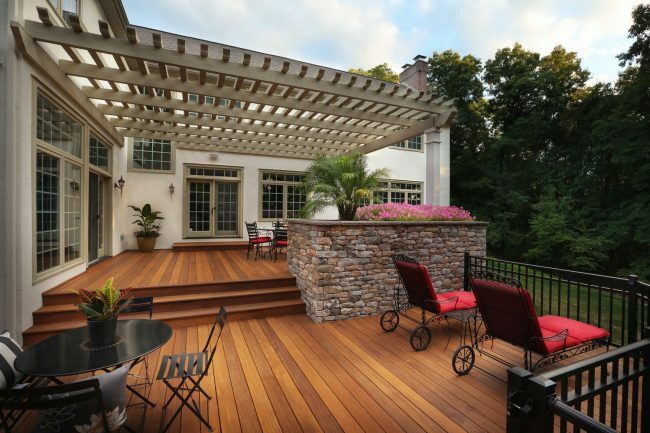 Tropical hardwood decking is gaining popularity in the outdoor living industry because of its density, versatility, reliability and wicked good looks. 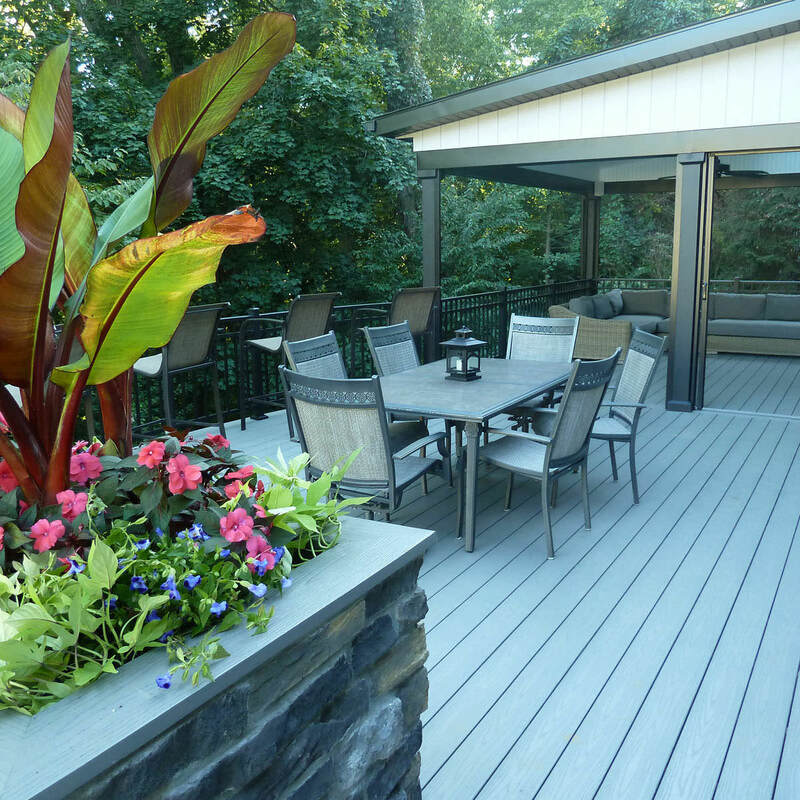 Not only will hardwood decks last 50+ years, the aesthetic is beyond comparison and its value remains unmatched. 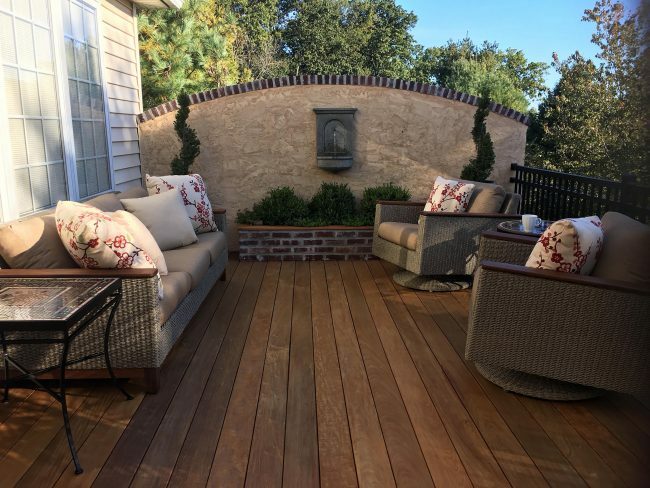 While composite decking is more of an investment than pressure treated wood, and tropical hardwood is more of an investment than composite decking, the saying is true that you get what you pay for. 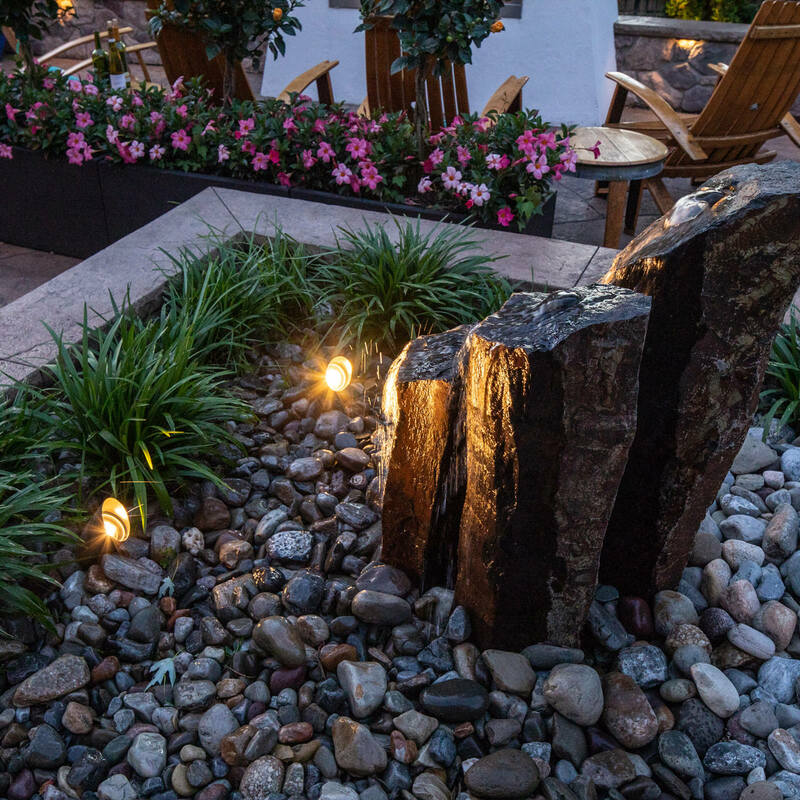 In a more recent shift to invest and maintain outdoor features, rather than the use it and replace it culture we used to know, you will find that the propulsion towards meaningful materials and sustainability will be the new wave. …and you can’t have a beautiful outdoor space without furniture to match! 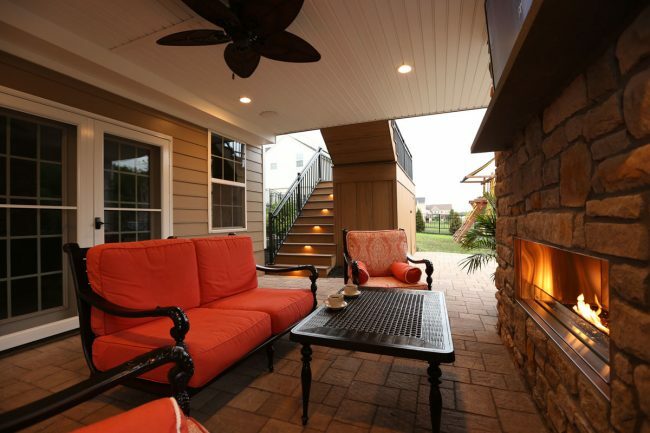 A key component of a comfortable and welcoming outdoor living environment rests in the seat of the furniture. It is hard to relax and enjoy yourself if you are concerned that the noisy wicker seat beneath you will crumble during your first shift of weight or bout of laughter. Research and development has taken outdoor furniture to new heights; it is now possible to have upholstered furniture outside without fear of your investment becoming a soggy and moldy mess. The ability to pair plush and cozy chairs with teak tabletop or ipe benches opens a new world of design. Being able to pay as much attention to detail in outdoor furniture as you would with your living room sofa says a lot for the direction of outdoor living in 2018 and beyond. 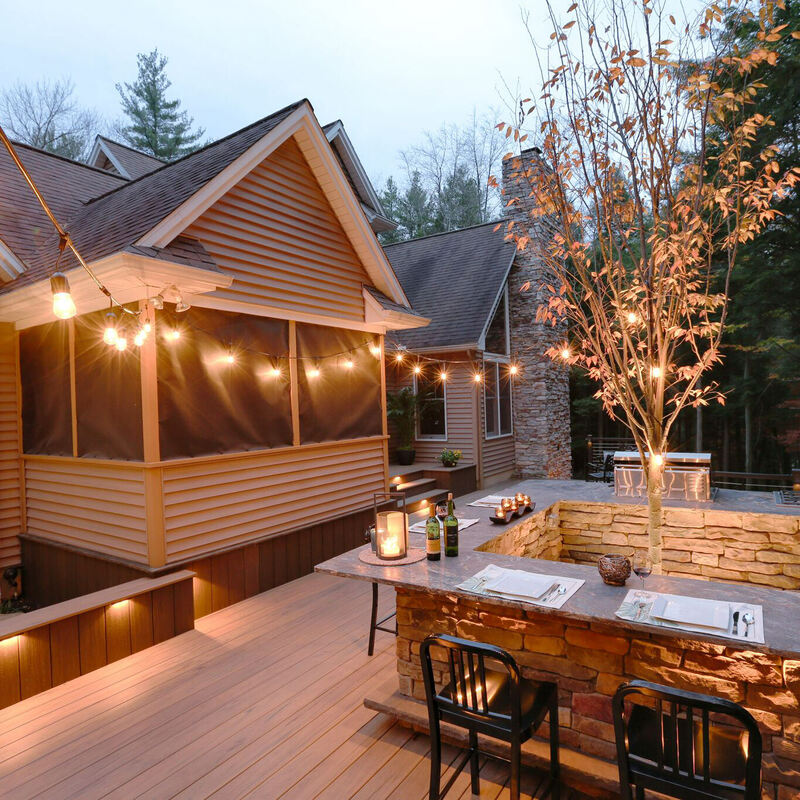 Transforming and tailoring outdoor spaces to be as warm and welcoming as your favorite indoor room will lead you to view your home in a new light and fall in love with your property all over again. Our final forecast for top trends in outdoor living for the year is a nice touch of DIY, a backyard garden. Of course, many of us garden already. There is something special about being a part of the garden bed to salad bowl movement…a pride if you will. Instead of slapping together a wooden box full of dirt and seeds at the corner of the property (as to not subtract from your free yardspace), why not bring your beds front and center? Incorporating raised garden beds into your landscape design brings a cohesive designer touch to your property. For example, upgrading that pressure treated lumber box to a beautiful reclaimed granite plot next to your patio not only brings your food source closer to the home, but it will look as if it belongs there, as intended as the patio itself! 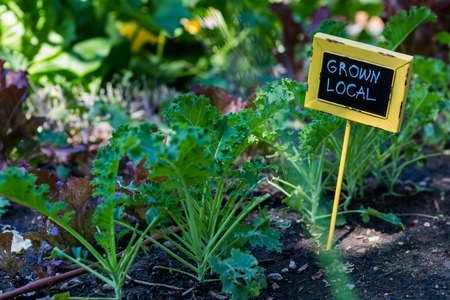 The edible garden possibilities within your outdoor living spaces are only limited by your imagination. 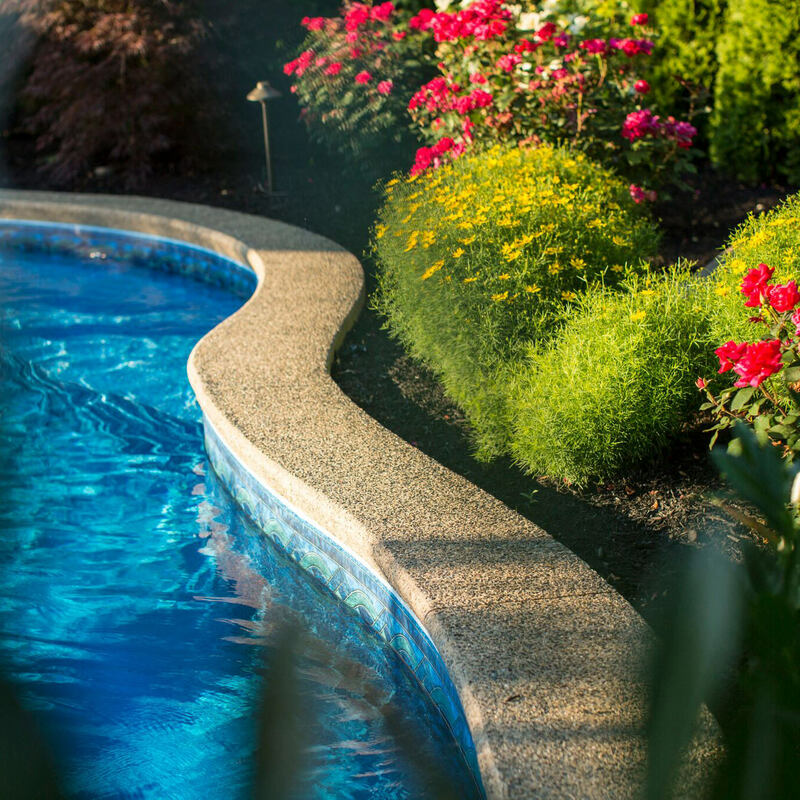 Whether planning to drastically update your outdoor living spaces or merely shake things up a bit this upcoming season, your landscape designer can provide you with the detailed creativity and experience that will guarantee a backyard success. 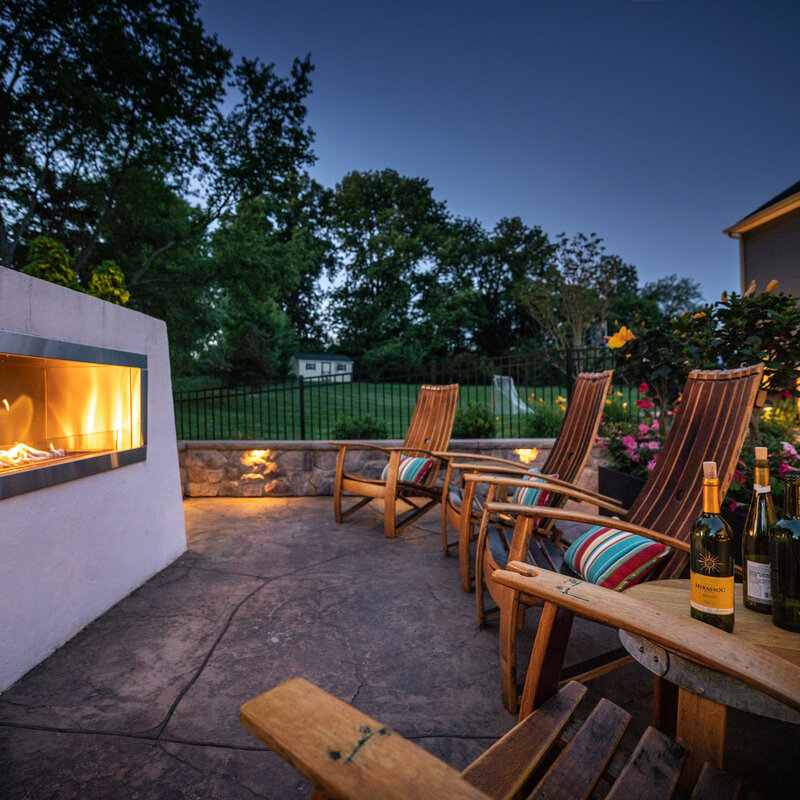 For those in the Poconos, Lehigh Valley through the Main Line of Philadelphia and western New Jersey, MasterPLAN Outdoor Living would love to guide you along your backyard transformation journey! 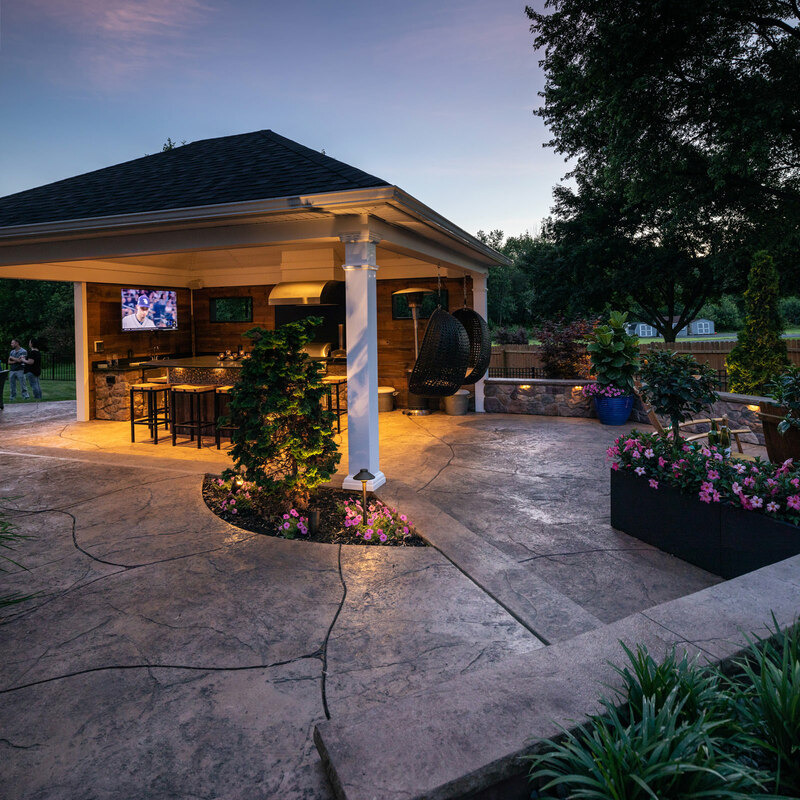 From our highly detailed designs and installation of structure and landscape, a comprehensive and timeless outdoor living plan is all it takes to live your best life outdoors; feel free to reach out to MasterPLAN when you are ready to discuss all options for your own property! When exterior architecture meets function and style, you have MasterPLAN.